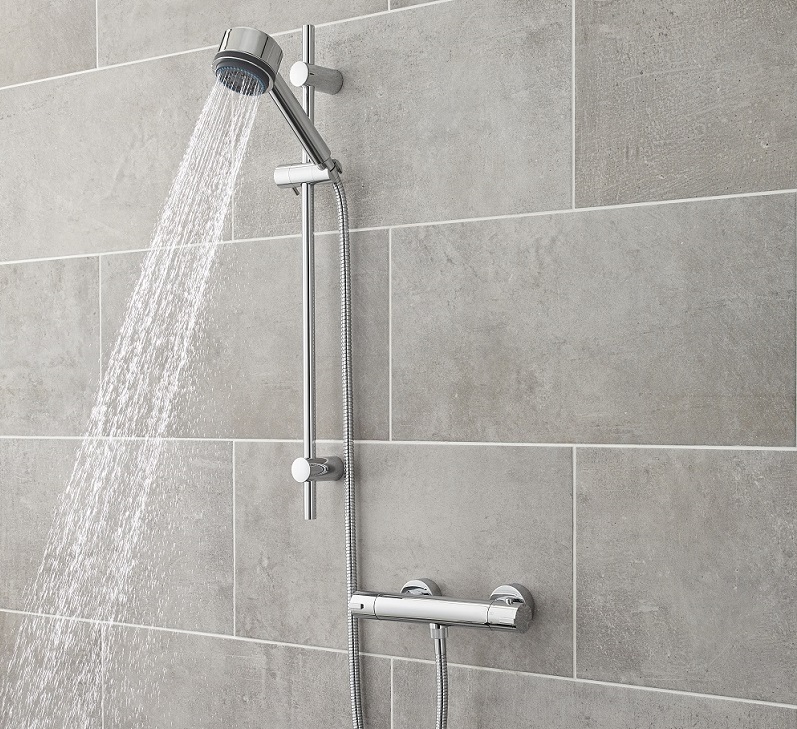 From thermostatic shower valves, mixer showers to shower panels and more, it’s no surprise that choosing the right shower can be a little tricky. So, to help you out and to make things easier, we’ve uncovered all there is to know about showers including the different types, how they are made and the things to consider before you buy. When buying a shower, there’s a number of things to take into consideration such as the water pressure and the type of water system you have. Take a look at our guide on how to create an amazing showering experience, where you’ll find out about water pressure and the different types of water systems. How does a shower work? Different types of showers work in different ways. Shower valves take the hot and cold water feed from your existing system and mix the water in a cartridge in the body of the valve. The water is then delivered through the shower head at a temperature and flow that you’ll control. Electric showers take a cold water feed and heat the water over an electric element to supply water at your chosen temperature through the shower head. Shower panels operate in a similar way to shower valves as they take the hot and cold water feed and blend them into your ideal temperature. They do however require a higher water pressure to ensure optimal performance. Most shower valves are manufactured from cast brass with a ceramic disc cartridge and a chrome plated trim. An electric shower is made from a plastic moulding that covers the electrical and other working parts of the shower. Shower panels are pre-plumbed to connect the shower valve, body jets and shower head – they are easier to install than other shower types, but they will need a high pressure water supply. Many household cleaning products contain abrasives and chemical substances and therefore should not be used to clean plated fittings. Instead use a mild washing-up detergent or soap solution, and then wipe dry using a soft cloth. Buying a high quality shower that meets your requirements is an important part of your new bathroom, and we understand that it can be difficult trying to choose the right one when you’re confronted with a load of jargon that doesn’t make much sense. So, to make things clearer, here’s some words and phrases you may come across when shopping for a new shower. A concealed shower valve is recessed into the wall, and controls the flow and temperature of the water. An exposed shower valve is wall mounted, and controls the flow and temperature of the water. An exposed shower valve requires less work to install compared to a concealed shower valve. A manual shower valve does not maintain the desired water temperature and pressure if another water outlet is used elsewhere in your home. A thermostatic shower valve provides precise temperature and flow control, and is designed to prevent fluctuations in temperature if another water outlet is in use somewhere else in your home. Measured in litres per minute, the flow rate is the amount of water different showers generate, which will depend on the type of shower system and water system in your house. The higher the flow rate, the higher the volume of water, therefore resulting in a more powerful shower. This is the type of plumbing system in your house. 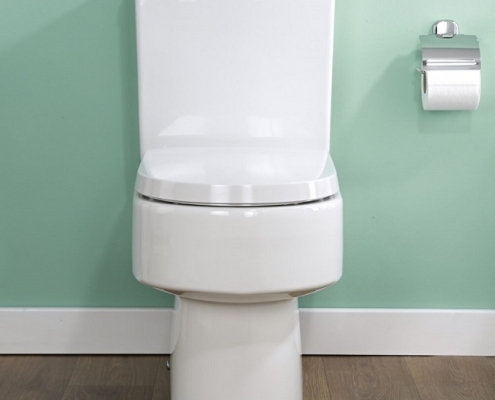 The three main types of water system are gravity, pressurised and combination boiler. A shower valve controls the flow of water to the outlets. Some valves are thermostatically controlled and others are manually controlled – here we explain the differences. Easy to use, manual shower valves typically feature a single lever that controls both the temperature and flow rate. Manual shower valves have no thermostatic control, which means that if someone turns on a tap or flushes a toilet in another bathroom, the water can run scalding hot or freezing cold. Thermostatic shower valves provide precise control over the water temperature. They are designed to maintain the temperature of the water within a +/- 2°C range. If there’s any sudden change in the flow of hot or cold water, the valve will respond to compensate and maintain a constant temperature. 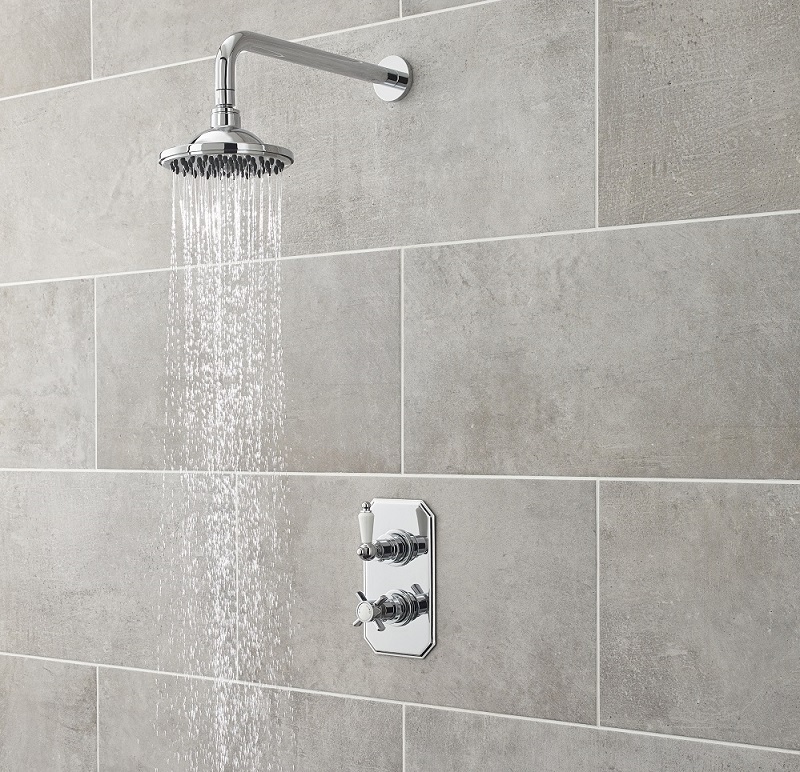 To prevent scalding, a thermostatic shower valve will automatically shut-off if the cold or hot water fails. 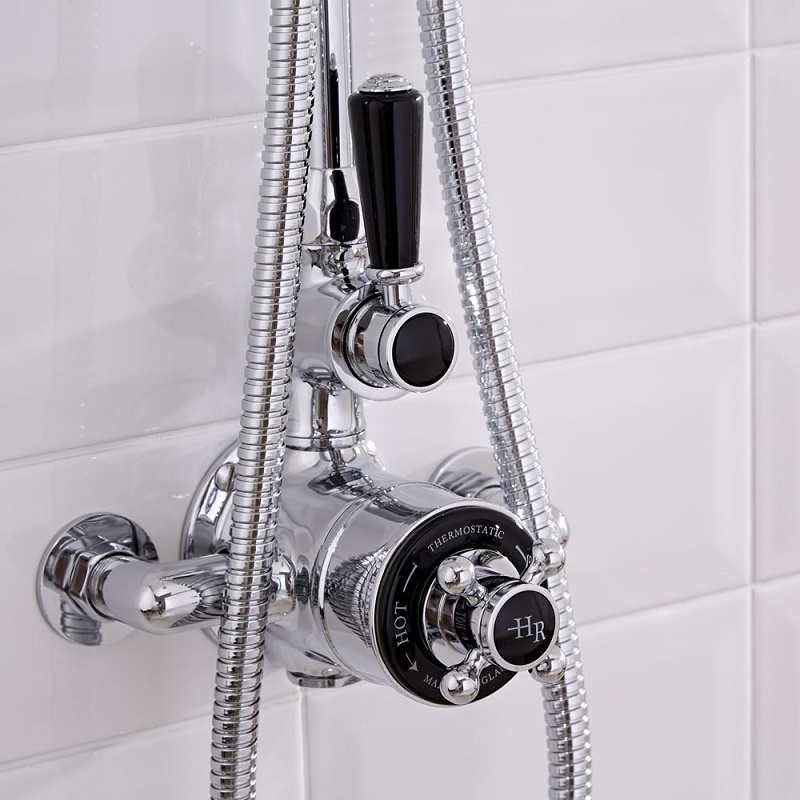 Thermostatic shower valves usually feature two or three handles depending on how many outlets you want. You can choose between one, two or three outlets and create a shower system that’s tailored to your requirements. A concealed shower valve is a built-in valve that’s hidden behind the tiles in a shower enclosure. The only visible part is the trim plate and handles. This type of shower valve conceals unsightly pipework and fittings ensuring a neat, streamlined look. Concealed valves are available in an array of styles to enhance any bathroom design. If you’re considering opting for a concealed shower valve you’ll need to think about the recess that needs to be created behind the tiling – they typically need a recess depth of approximately 100mm. A thin stud wall can be built if you don’t have this space available. If access is needed to the valve in the future, the handles can easily be removed to expose the cartridge, which can be removed for cleaning or replacing. An exposed shower valve is typically a horizontal bar that’s fitted to the wall, all the working parts are contained within. Although an exposed valve doesn’t provide a streamlined look like the concealed option, they are less expensive and easier to install. If you have a solid brick wall, exposed shower valves are a good choice. Only the hot and cold water pipe feeds need chasing in within the wall, not the whole valve, which will reduce the installation cost. Concealed valves can be positioned on a wall away from the outlet, so you could install the valve close to the shower entrance on one wall, but then place the shower kit within the shower enclosure on the opposite side. Exposed shower valves do not offer the same flexibility as you are limited by the shower hose length. Delivering a superb showering experience, shower towers incorporate body jets, large fixed shower head and a shower handset. Available in a range of stylish designs, thermostatic shower towers are a great option for creating a contemporary look. Easy to install and use, a shower tower requires a hot and cold water feed, usually with a minimum of 2.0 bar pressure. Suitable for fully modulating combi boilers, pumped water systems and high pressure unvented heating systems, shower towers feature a thermostat to regulate the temperature, which prevents extremes of heat. They also have a diverter so you can switch between the different outlets. The right shower head is an important part of choosing a new shower. The main types of shower head are fixed shower heads and hand showers. Shower heads available in various sizes and styles including modern and traditional. A great option for creating a designer look, fixed shower heads are fitted to the wall or ceiling with an arm. Some shower heads include the arm, and some are supplied without. 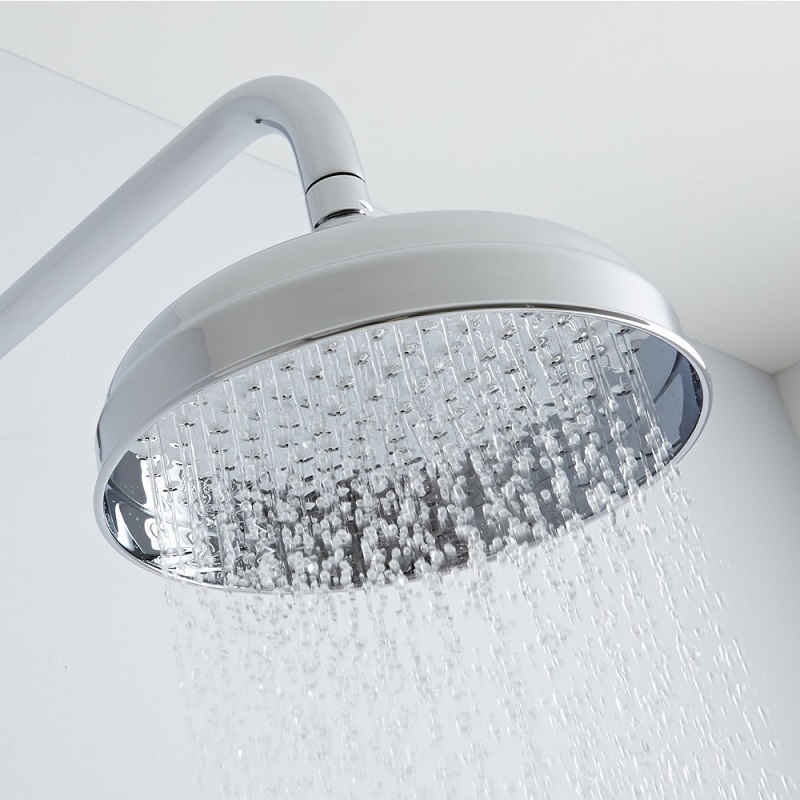 A fixed shower head delivers a refreshing rainfall effect. Although this type of shower head looks great and provides a superb showering experience, it’s not a practical option for a busy family bathroom, as it can’t be detached for when you need to rinse and clean around your enclosure. An option would be to fit a slide rail kit, which features a detachable hand shower. Hand showers can be supplied as part of a slide rail kit or rigid riser shower kit. They can also be supplied with a hose and wall bracket or simply on their own. Slide rail kits are a very popular option as they are easy to install and are really practical too. Connected to a flexible hose, the hand shower slots into a bracket, which can be moved up and down the rail. 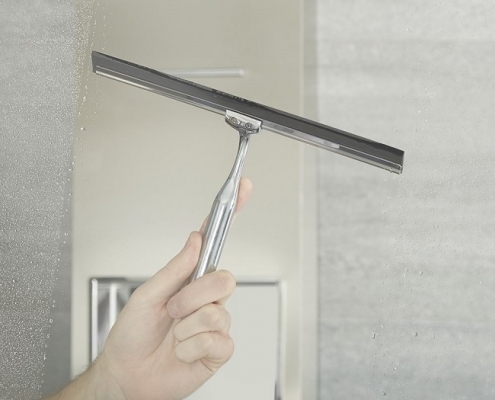 The hand shower can be removed from the holder allowing you to clean your shower enclosure with ease. 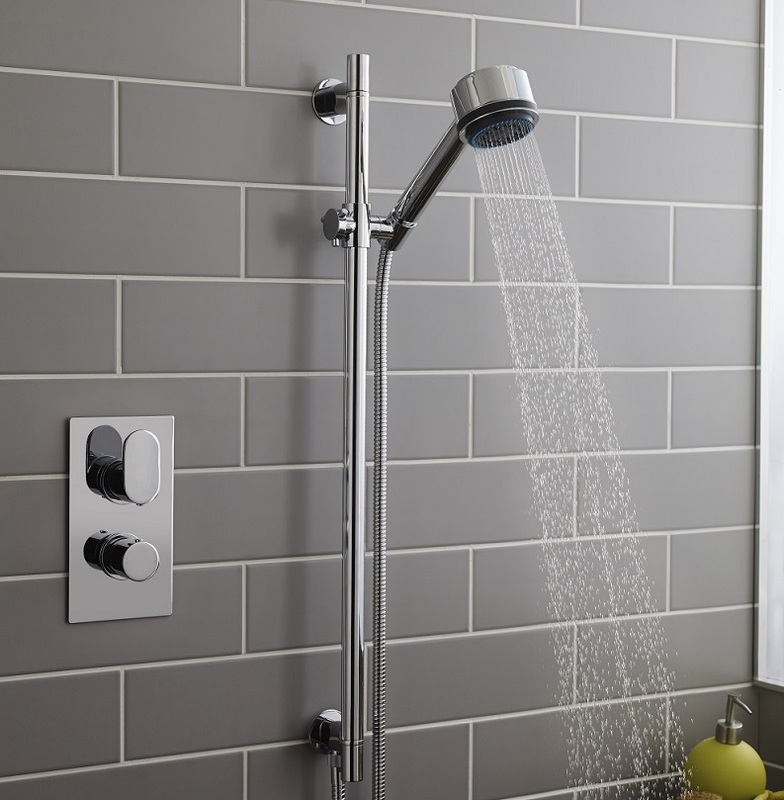 Available in a wide range of sizes and styles, a fixed shower head is directly mounted to the wall or ceiling on an arm, but some can have the pipework concealed within the wall or ceiling. A fixed shower head remains in one position. Fixed shower heads deliver a refreshing rainfall effect and are a great option if you want to create a designer look. 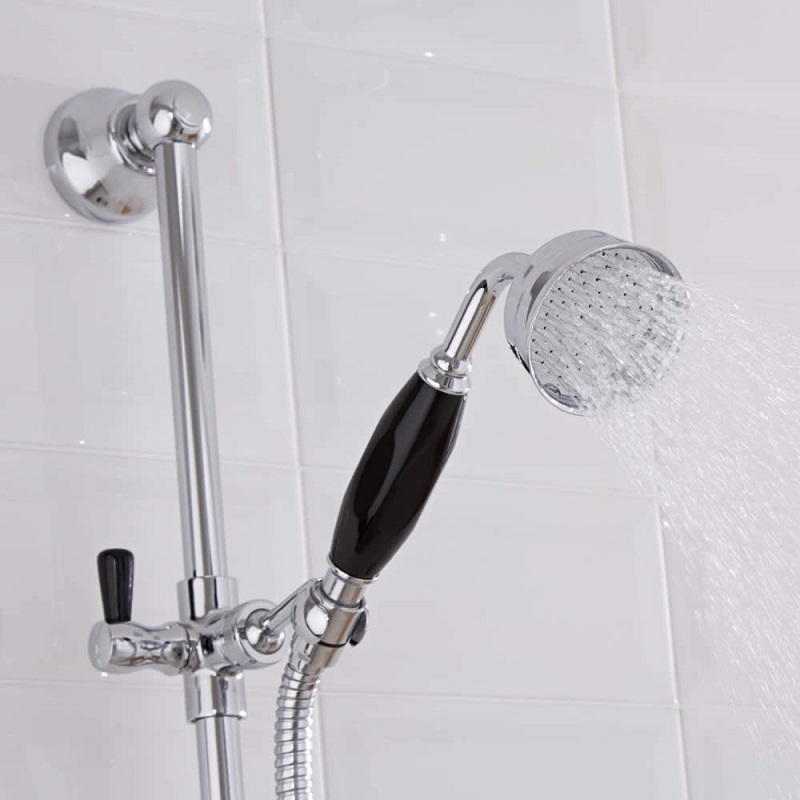 Shower handsets are smaller than a fixed shower head and are connected to a flexible shower hose. Available in modern and traditional styles, a shower handset can be part of a slide rail kit, rigid riser kit or a bath shower mixer tap. 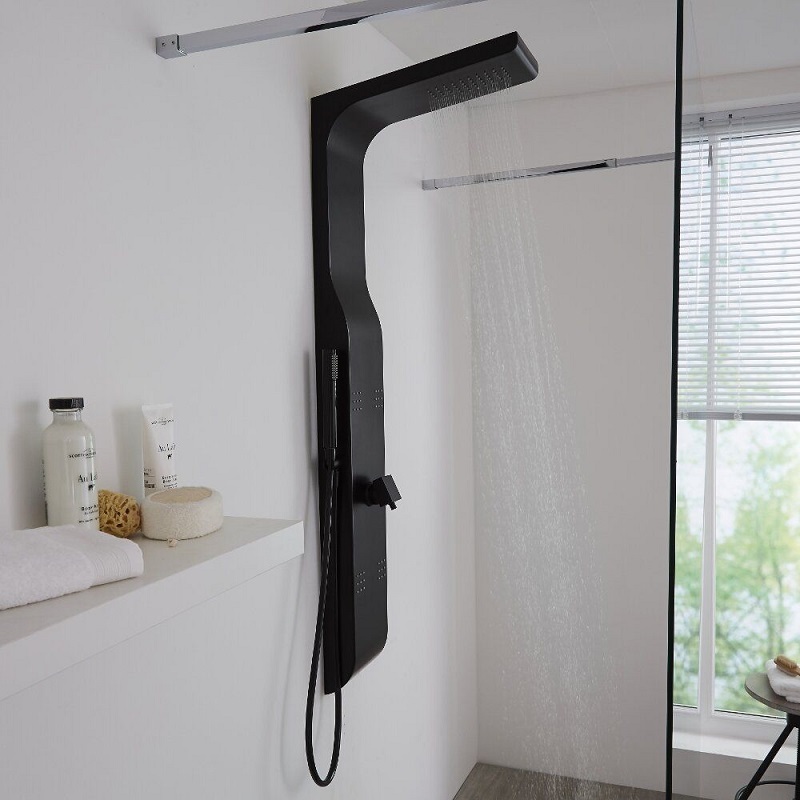 You can also purchase them on their own if you’re looking to replace an old shower handset or with a bracket that you connect to the wall. The handset can be removed from the bracket, which allows you to rinse and clean around your bath or shower enclosure with ease. Again, shower kits are available in a choice of styles ranging from the modern to the traditional. Shower kits usually include a riser rail, shower handset, hose and some may include an outlet elbow. The rail fits to the wall, and the handset can slide up and down on a bracket so you can adjust the height to suit you. 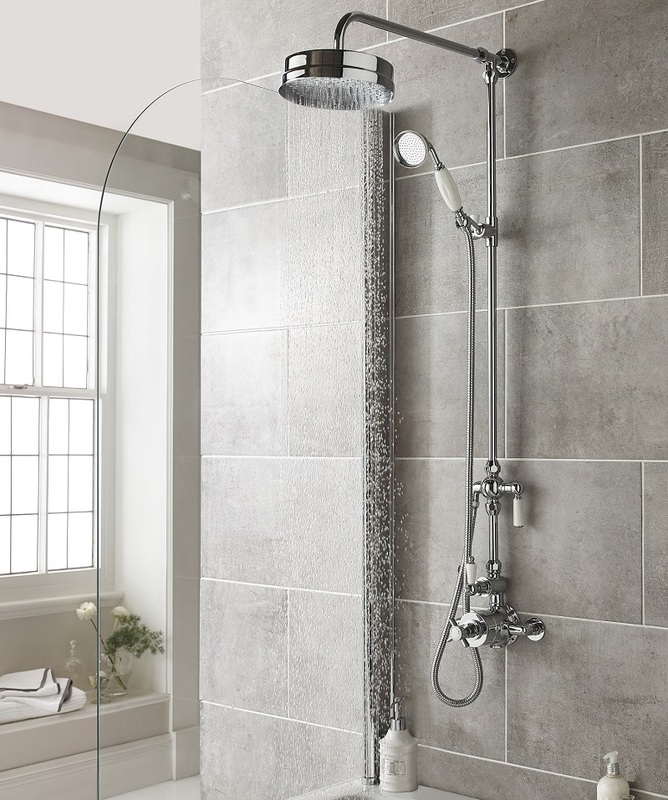 Fit your new thermostatic mixer shower with the help of our step-by-step guide.